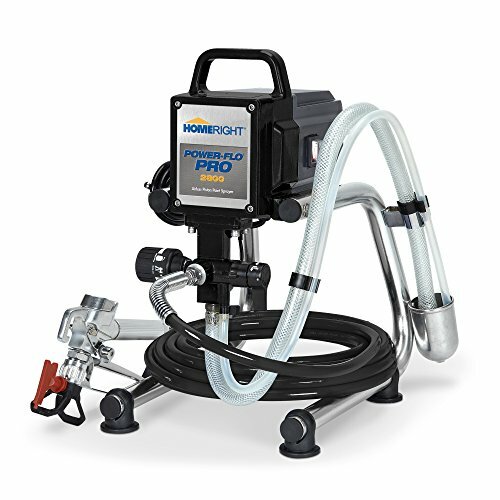 The HomeRight Super Finish Max Extra C800971 Paint Sprayer is an amazing paint sprayer and the newest product from the HomeRight paintsprayer brand. The paint sprayer has a dimension of 9.5 x 6 x 12.5 inches. It comes with six spray tips, a container lid, wrench, spray nozzle and cleaning brush. It has a weight of 2.76 pounds. It is a portable and lightweight paint sprayer. 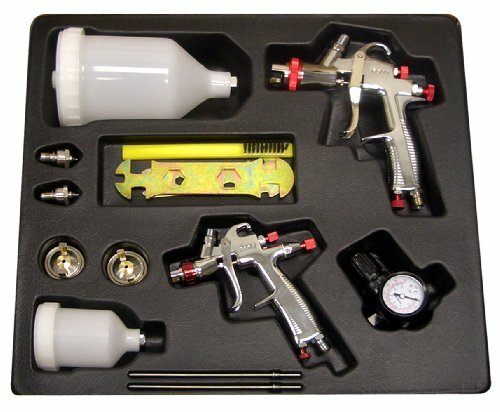 The Paint Sprayer comes with 6 spray tips, each of them allows you to paint in a different pattern. Moreover, it comes with an adjustable knob which allows a painter to adjust the width and the intensity of spray depending on what is being painted. This makes the product very versatile and capable of being used for a variety of painting projects. Additionally, this unit is extremely powerful and features a robust turbine motor that generates 450 watts of power, making this sprayer very efficient. Thanks to the powerful motor, you won’t need any air compressor. Moreover, the kit includes a brass needle and nozzle which makes it very durable. Moreover, the brass nozzle ensures that it produces a smooth and fine finish and can withstand the wear and tear of large-scale painting on a frequent basis. 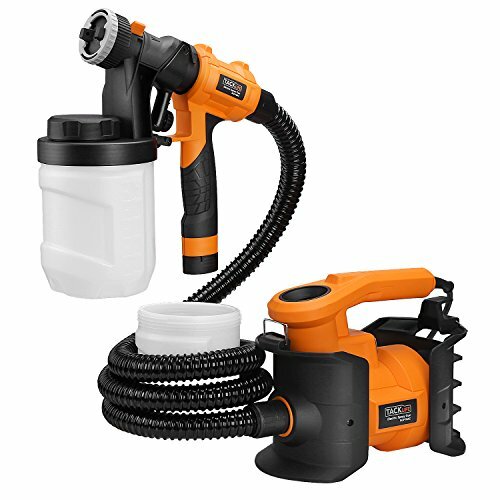 Another feature of the paint sprayer is that it comes with a 39 fluid ounce container which guarantees that a painter can pour in a substantial quantity of paint. This allows a painter to paint for longer periods of time without the need for refilling.It is worthy of note that the paint sprayer is a high volume low-pressure product which guarantees that more paint can be dispensed in less time. This feature also ensures that it is highly efficient and produces smooth paint finishes. 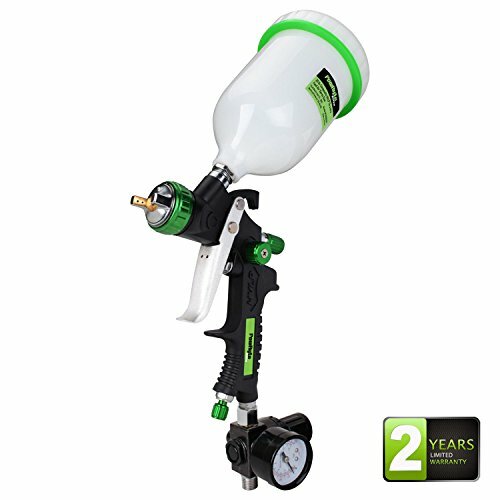 One of the key features of this paint sprayer is that it comes with a flow control knob. This flow control knob is located on the trigger. The flow control knob helps a painter to determine the amount of paint that would be dispensed. The further the trigger is pulled, the more the paint it dispenses. The flow control knob ensures that a painter can use the product for a variety of painting projects. Additionally, this ensures that both thick objects and thin ones can be sprayed with the product. Thicker objects would receive more paint while thinner objects would receive less paint. One of the benefits of acquiring this paint sprayer is that it can paint more in less time. 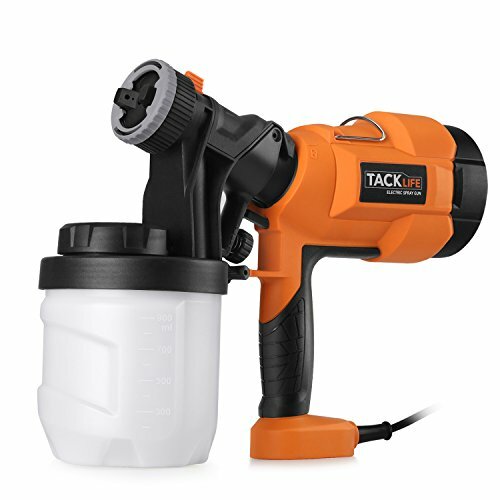 The paint sprayer is lightweight and portable; this allows a painter to move it from one spot to another moreover easily, its lightweight also guarantees easy handling. 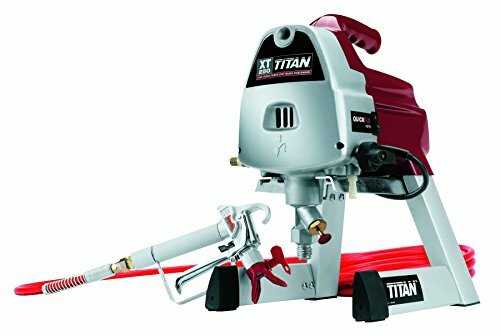 To cap it all off, its powerful turbine motor which provides 450 watts of power ensures that more paint is dispensed in less time. Another benefit of the paint sprayer is that it is ideal for indoor painting projects. Its portable design and flow control knob ensures that it is the ideal paint sprayer for spraying furniture, dressers, cabinets, cupboard and other items commonly found within the home. Its flow control knob guarantees that there is minimal cleaning to do after a painting project. 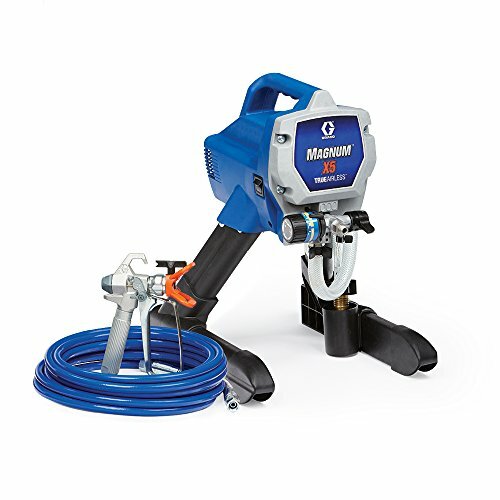 The paint sprayer is capable of handling both water-based and oil-based paint. This makes it a good deal for its price. Moreover, there is no thinning required before painting. It is worthy of note that a painter does not need to thin paints that are to be sprayed with this product. Its turbine motor is capable of handling thicker paints without negatively impacting desired results. This saves time and energy during painting. All the features of the paint sprayer work together to provide a smooth and fine finish. 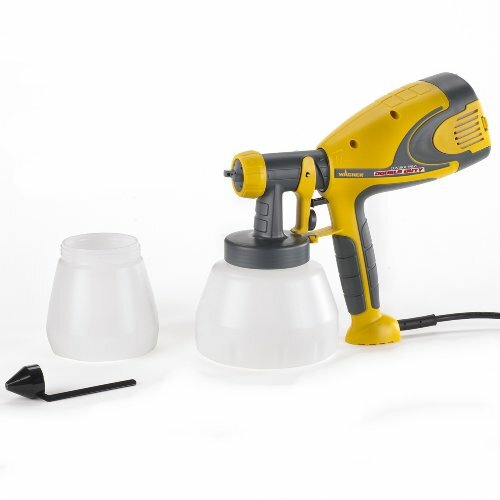 Its powerful turbine motor provides enough power to atomize paints, while the flow control knob ensures that only the quantity of paint needed at a particular time is sprayed. This among others ensures that the result of a painting exercise is satisfactory. One of the benefits of using this paint sprayer is that it comes with an ergonomic design. This ensures that it is easy to setup, clean and maintain. This makes it a highly efficient paint sprayer. It is also worthy of note that its simplistic design guarantees that a person can use it, even if you have no painting experience. 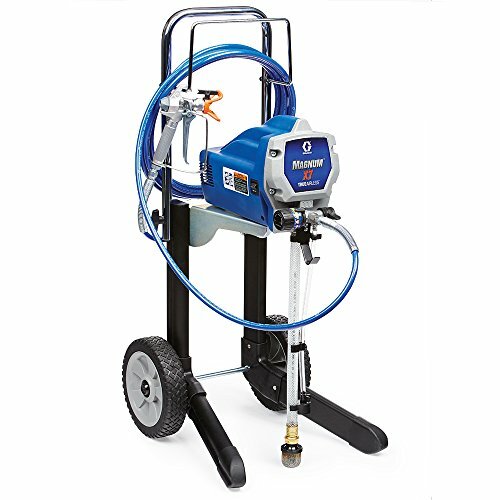 The paint sprayer is capable of spraying different types of paints. This is why it is popularly regarded as a versatile paint sprayer. It can spray satin, latex, varnishes, enamel among others. The paint sprayer is portable and lightweight. This makes it very easy to handle and maintain. As a result of this, it is easy for a painter to use the product for a variety of painting projects. The fact that it is easy to handle guarantees that a painter is more likely to get the best results. Moreover, it ensures that large-scale painting can be done without stress. 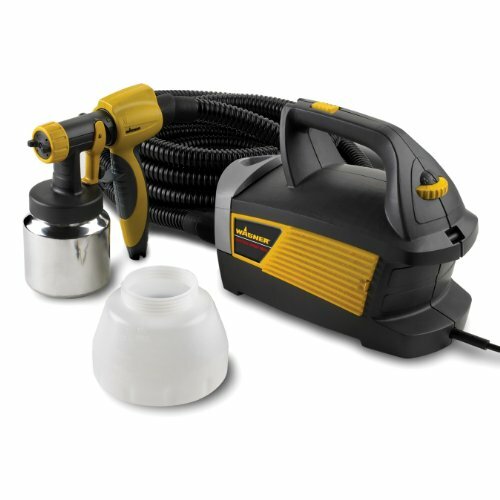 Furthermore, its portability makes it the ideal indoor paint sprayer for furniture and smaller items. The HomeRight Super Finish Max Extra is a good deal because it has several features and yet comes at an affordable price. 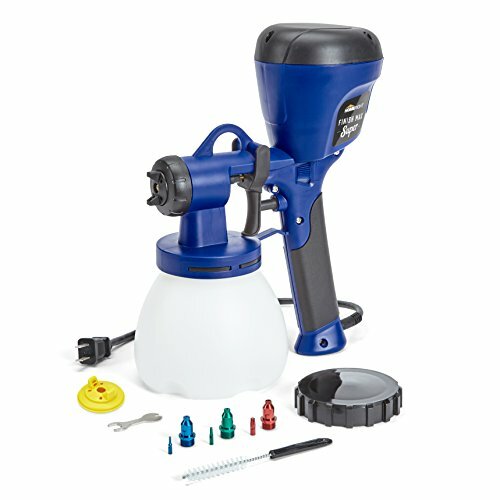 It is a great paint sprayer for DIY enthusiasts. Moreover, the fact that it is easy to set up and easy to handle ensures that it can be used by any painter irrespective of the skill level. Moreover, the paint sprayer is easy to maintain which guarantees that it would have a long lifespan. Considering the results associated with the product, it is a great deal for its price.